I hope this finds you all warm and toasty. Here in Central NY we are getting a winter blast from our friend Lake Ontario. Right now, I am listening to the wind knock at my door, driving my poor little Tucker crazy! Anyway, I did manage to get a couple of cards made using the "First Sight" stamp set from the 2016 Occasions Catalog found on page 36. I just love this set. I find it to be so versatile and so pretty. The first card I used Watermelon Wonder Ribbon and ink with Sahara Sand ink and cardstock. 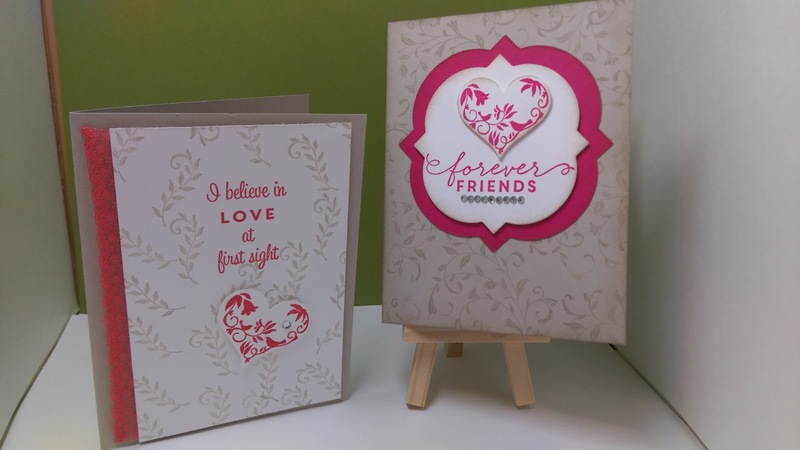 The second card uses Sahara Sand Cardstock and ink with Melon Mambo. Stay tuned for more ideas using this set and be sure to check out this weeks weekly deals and don't forget about my online party where you could be the hostess with the mostest...mostest Stampin' Rewards that is! So be sure to place a minimum $30 order to be placed in the drawing and you could be selecting a minimum of $15 in free product! Just use the hostess code AZHFKHGX when placing your order. In the meantime, have a great day, stay warm and happy stamping!